Further, we’ve just launched our new Speaking page on the website! We’ve got links to many of our best talks as well as details on getting in touch for a speaking event to your organization if interested! Here are some of the highlights from the fall of 2013! We started our fall tour at the University of Michigan, delivering the Aerospace Faculty Seminar on October 17. We were excited to give a fairly technical lecture to a world-class aerospace department. We had been invited by Professor Martins, Multi-Disciplinary Optimization expert. Prof. Martins had provided early guidance in the MDO approach used to design the Snowbird and Atlas while Todd and I were students at U of T.
Cameron and Todd speak at PopTech in Camden, Maine (Photo Credit PopTech/Kris Krug). Shortly afterwards we were off to PopTech 2013, “Sparks of Brilliance”, in Camden, Maine on October 24th. This incredible creative conference featured an exciting cross-section of many fields including science, engineering, fine art, sociology, and neurology, to name a few. We had a great opportunity to share our stories of creative insight as well as failure, as well as find inspiration ourselves in talks on interactive artwork, social entrepreneurship, and the incredible humanitarian work being done by the PopTech Fellows. Todd speaking about challenges at TEDxYouth Toronto (Photo Credit TEDxYouth Toronto). 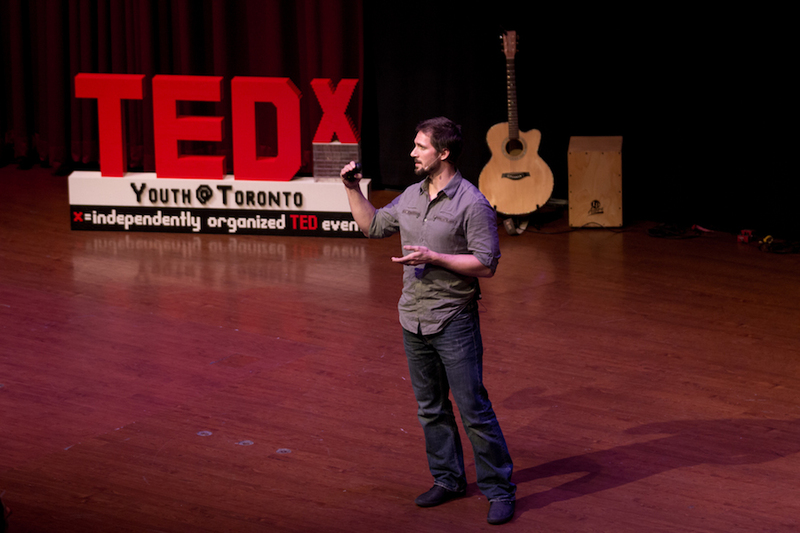 We were able to give a talk of a more inspirational nature at the TEDxYouth Toronto on November 16th. The audience here was largely high school students, and we were able to pitch in our two cents with our talk “Challenge Drives Discovery”. Our goal was to inspire everyone to find challenges they’re passionate about in order to encourage the greatest possible personal growth, a crucial life-lesson during this formative time in their education. I travelled to Hampton, Virginia next to speak at NASA Langley Research Centre and the Virginia Aerospace Centre to give two talks to the research center staff and interested public. This was a great trip which included a survey of the incredible work going on at NASA Langley in both space exploration and atmospheric flight research. I was also able to meet Juan Cruz, a hero of ours who had been Chief Structural Engineer on the Daedalus HPA project at MIT in the 80’s, and we had a great time “talking shop”. Cameron speaks at Berlin Minds. The fall finished up with a great pair of talks as Berlin Minds and Zurich Minds on December 10/11. These events are part of a unique community of business leaders and research leaders gathered from throughout Europe. There was a diverse collection of fields and disciplines represented, as per Zurich Minds’ original mission of connecting the business and science worlds for greater collaboration and growth. We were again inspired by talks concerning novel technologies, exciting medical and science research, and insights from Director Mark Forsters’ experiences in filmmaking. An exciting culmination to a few great months of outreach and speaking! Todd discusses some of Atlas’ most unique engineering aspects at Zurich Minds (Photo credit Zurich Minds).